If you have always wanted to add factory-like heated seats to your Vehicle or Boat, then this Heated Seat kit is the ideal solution, whether you own a car, SUV, Truck, Boat or Plane. The Carbon Fiber heating element is the best seat heating pad material in the marketplace. The Carbon Fiber thread is pliable and a good conductor of electricity which can be designed to incorporate a variety of interconnected shapes which form a grid and can be sewn over. Carbon Fiber will not corrode, become weak or break like copper heating elements. 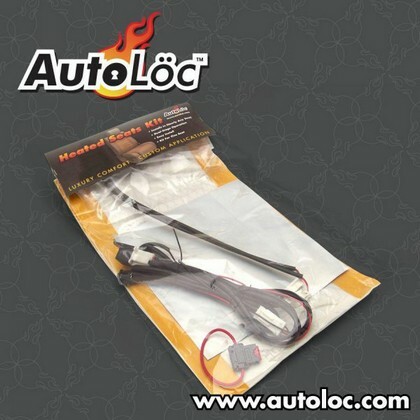 Featured on several TV shows including Monster Garage and Pimp My Ride, AutoLoc kits deliver where all others fails. Insist on the best, and insist on AutoLoc. You be glad you did. Q: What are the dimensions of the heating pads (Autoloc part number HR1000)? A: Each pad is 10.5 inches wide, 19 inches deep. Q: What are seat heaters? Why buy them? A: Driving in a cold vehicle is never fun. But on a chilly day it takes some time for your engine heater to kick in, which means you have to live with the frigid conditions until the engine has a chance to warm up. Seat heaters are electronic heating elements that install into your seat giving your body warmth on even the coldest days. Unlike conventional vehicle heaters, seat heaters act quickly so there is no waiting around for a break from the cold. These heaters can be adapted to virtually any vehicle and are reasonably priced so that you do not have to pay a fortune for the simple comfort of some heat in your seat. Here at Andy’s we prefer seat heaters to conventional heaters not only for their fast operating times but also because you do not need to have the noisy and annoying fan blowing in order to feel the heat. If you frequent cold climates, seat heaters are a must have item.